What beatmania versions are out there? beatmania: THE SOUND OF TOKYO! 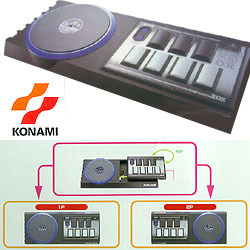 Which controller is best for beatmania on home consoles? As for the others, like the 5 key ASCII model, and the 3rd party knockoffs, well I don't know... I've tried playing 6th+Core with the ASCII controller... instead of a turntable, imagine trying to play with a really large doorknob ;P (since the turntable's just a large circle of plastic :( ) Just stick with the Konami IIDX controller if you can, and you'll be fine, even on 5 key. 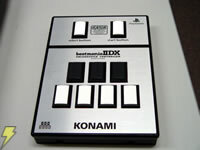 Does the IIDX controller function with the original 5 key beatmanias for PSOne? On the IIDX controller, what's the extension for? What's the correct pronunciation of 'IIDX'? Why do some generic videos only say "beatmania II"? beatmania III, on the other hand, is possibly the least known of the three games. heck, even I have never played it... but it sounds really neat. it features 5 keys, a turntable, and a effector footpedal. There is also a mode that incorporates the footpedal as an additional key during the game, which sounds like an interesting experience.Other additions include a headphone jack for each player, and a 3.5" disk drive to save your high scores and effector settings to disk. HipHopMania is KofA's attempt to bring the beatmania series stateside. However the HHM machines seem to be more scarce over here. The game itself is in English, but the cabinets still retain some of the Japanese instructions/warnings (though they do have english too)! Unfortunately since the 5-key original series is coming to a close in Japan with the release of beatmania: THE FINAL, it doesn't look like beatmania will ever get the chance to hit big in the US... not with any new machines, anyway. Free - Allows you to play two songs for free, without penalty. Light 7 - (IIDX Only) An easier version of regular 7-key mode. Double Play - Play using both sets of keys and turntables. Hidden - Hides the notes 1/3 of the way down. Sudden - Reveals the notes 1/3 of the way down. Stealth - Hides the notes completely. Internet Ranking - play a specific set of songs (known as 'courses') and then submit your score via password to Konami AM's Japanese site.This feature was also recently introduced to Konami's own Dance Dance Revolution series in DDRMAX 2: 7th mix, with its own courses..
Use the Disc change option and put in 3rd Mix. Disc change again, to either 4th Mix, or Gottamix then 4th Mix. FINDING A NEW WORLD UTUMI(?????? Disc change again to Gottamix then 5th Mix or directly to 5th Mix. Sunshine Dance(Latino YOKAN-Mix) Togo project feat. Megu & Scotty D.
Then Disc Change again to Club Mix. greed eater (DEAL WITH IT MIX) the dust fathers SLAKE feat. R.C. MGS2 mission R NORIHIKO HIBINO L.E.D. LET THE BEAT HIT EM! BASS MIX STONE BROS. Beat Machine CRUNKY BOY Jr.
Give Me A Sign Shoichiro Hirata feat. "Red"
THE BIG VOYAGER -INFINITE PRAYER REINTERPRETATION- L.E.D. Theme of Denjin J L.E.D. Stick Around Megu with Scotty D.
and lastly dj Paranoia for the SoT Anti-mod code. Legal stuff: This FaQ Copyright 2002, 2573 DarkTetsuya. All Rights Reserved. "Bemani", "beatmania", "beatmania IIDX", "beatmania III", "Dance Dance Revolution," "drummania", and all related games and trademarks are Copyright 2002 Konami.